The mitral valve is an important component of the heart. It is situated between the heart’s two left chambers and ensures that blood moves forwards each time the heart contracts to pump blood around the body. Disease of the mitral valve is relatively common in Western countries, particularly where the valve becomes loose and allows blood to flow backwards. If the valve’s function is significantly impaired, surgery may be required to repair or replace the valve. While this has traditionally been performed by an open approach, several less invasive techniques have been developed in recent years and these are increasingly used for suitable patients. Mitral valve disease is characterized by either inappropriate backflow of blood through a loose mitral valve, known as mitral regurgitation, or impaired forward flow through a narrow valve, known as mitral stenosis. With either of these conditions, patients may experience shortness of breath, fatigue, palpitations, chest pain or fainting. Surgery is important to prevent worsening of these symptoms and eventual heart failure or heart attack. Whether or not a patient is suitable for minimally invasive surgery instead of traditional open surgery depends on a number of factors. These include disease severity, heart function, previous heart surgery, other medical conditions and complexity of the operation. 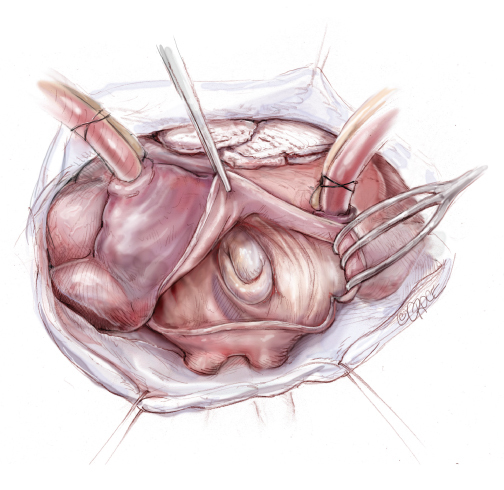 A patient with no history of heart surgery and with abnormality in only part of the mitral valve may be suitable for minimally invasive surgery. On the other hand, a patient requiring a complex operation such as a combined valve repair and coronary artery bypass graft operation would only be suitable for open surgery. Robotically-assisted mitral repair: the surgeon uses a camera and special computer console to control robotic arms through small cuts in the chest. This enables an undistorted 3-dimensional view of the valve. Minimally invasive mitral operations provide a number of benefits compared to open surgery. Due to the use of smaller incisions, there is reduced risk of blood loss, infection and pain after the operation. These operations also result in less scarring and allow for a shorter hospital stay, faster recovery period and faster return to work and normal daily activities. As with all surgical procedures, there are risks that need to be considered. These include small risks of bleeding, wound infection, abnormal heart rhythms, stroke and death. These risks vary between patients depending on the severity of their disease and other conditions. They are also lower in hospitals which specialize in minimally invasive mitral operations. As always, the risks should be weighed against the benefits and discussed with your surgeon.